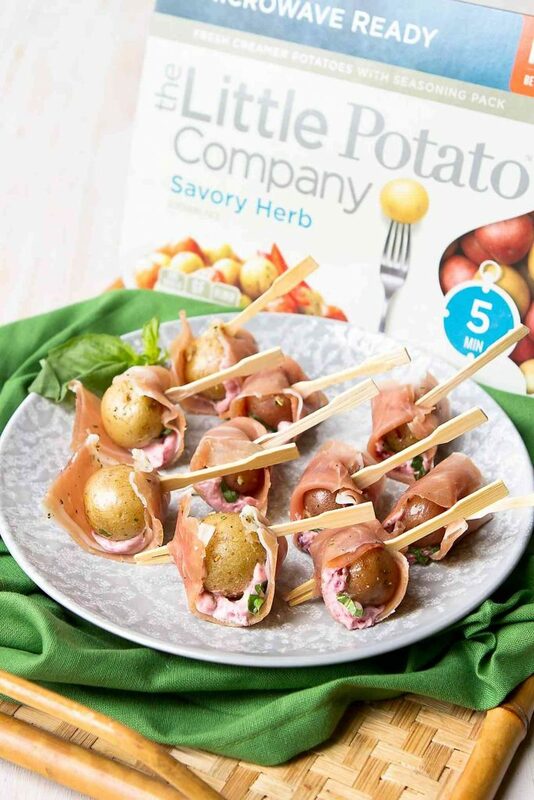 Perfectly bite-sized and delicious, these Prosciutto Potato Skewers have the perfect balance of sweet and savory, thanks to some cherry goat cheese. 41 calories and 2 Weight Watchers Freestyle SP. Thank you to The Little Potato Company for helping me share this recipe with you. My favorite part of a summertime party (or any party, for that matter)? The appetizers. Hands down. As much as I enjoy a great grilled steak or a plateful of grilled corn, nothing beats cruising between the appetizer plates, sampling a taste of every flavor. I’m an equal opportunity snacker! 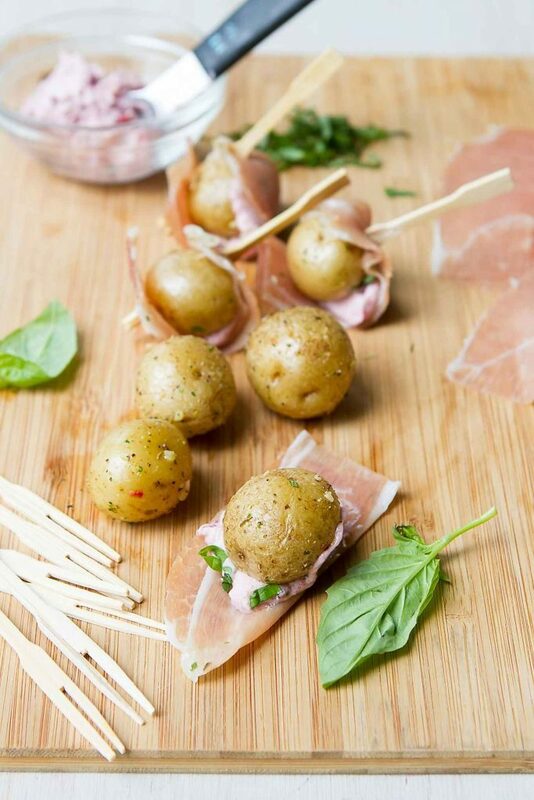 These prosciutto potato skewers look impressive for entertaining, but couldn’t be easier to put together. And with the addition of salty prosciutto, tangy goat cheese and sweet cherry preserves, they have the perfect balance of savory and sweet. I had never considered adding a sweet component to potato appetizers until I made some Greek-inspired goat cheese appetizers a couple of months ago. But let me tell you, they were addictive! So, when I felt inspired to dream up another appetizer using my favorite Little Potato Company Creamer potatoes, that sweet and savory combo popped into my mind. The truth is, I love using Creamer potatoes for appetizer recipes. Their size makes them ideal for bite-sized morsels. But don’t let that size fool you – there is so much flavor packed inside of them, which means that you don’t have to dress them up with a boat load of other ingredients. • I’m a sucker for smoked salmon! Make a dill yogurt, spread it on smoked salmon pieces and roll it around cooked Creamer potatoes. I could make a meal of these! Here’s the recipe. • Grill some zucchini strips, add some spices to creamy goat cheese and roll them all together with roasted Creamer potatoes. Here’s the recipe. • Take the flavors of a classic (but lightened-up) spinach and artichoke dip and stuff it inside of the potatoes. Bite-sized bliss! Here’s the recipe. • We’ve actually eaten this for dinner, but is fantastic for sharing at a party (think game day snacking!) 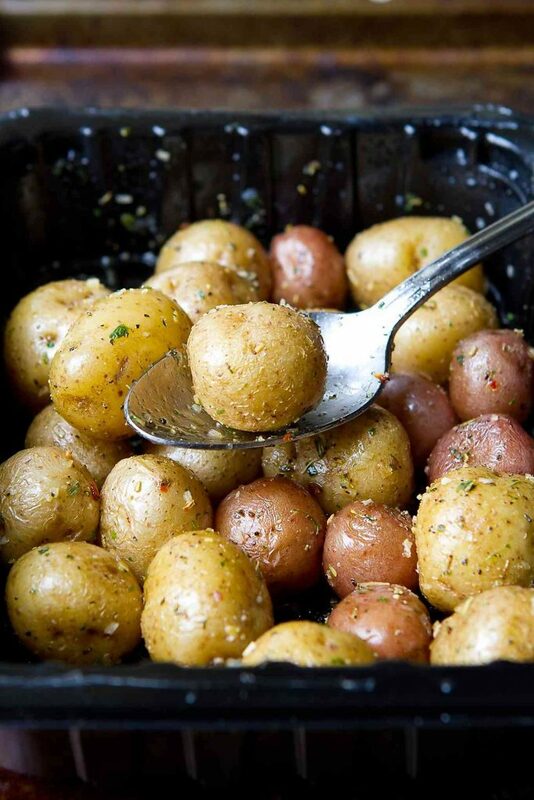 Roast the Creamer potatoes, then top with all of your favorite Mediterranean-inspired ingredients. Here’s the recipe. • Start with a package of either the Microwave Ready or Oven | Grill Ready Little Potato Company Creamer potatoes. Prepare according to directions. The only change I made was to use slightly less olive oil. • In a small bowl, stir together some softened goat cheese and cherry preserves. • Cut the prosciutto slices in half crosswise. You will use one half slice for each skewer. 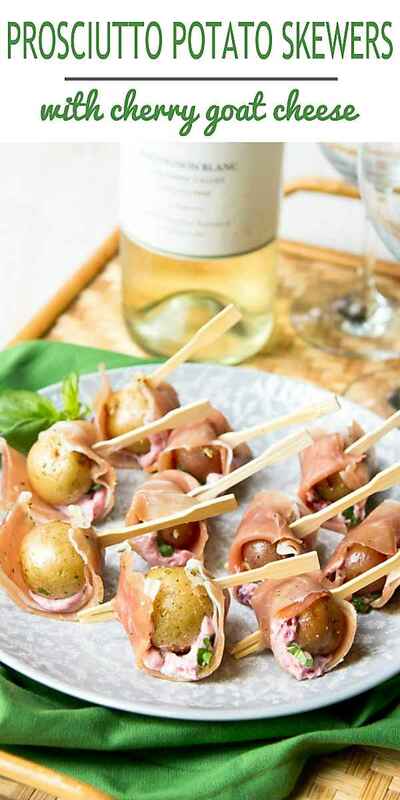 • Spread some of the goat cheese mixture on a piece of prosciutto, set the potato on top, roll together and secure with a skewer. 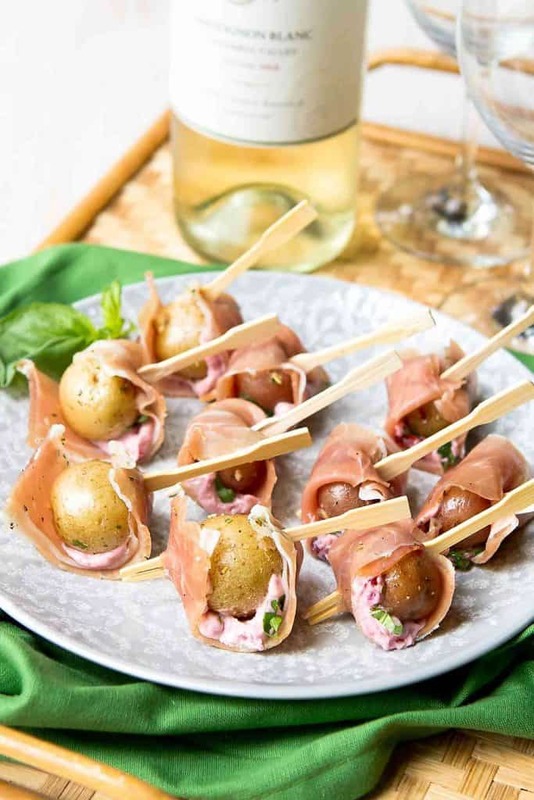 Perfectly bite-sized and delicious, these Prosciutto Potato Skewers have the perfect balance of sweet and savory, thanks to some cherry goat cheese. 41 calories and 2 Weight Watchers Freestyle SP. Cook the Creamer potatoes according to package directions. Stir in the olive oil and contents of the seasoning packet. Choose 14 potatoes to use and set aside the rest of the potatoes for another use. In a small bowl, stir together the goat cheese and cherry preserves. Spread ½ teaspoon of the goat cheese mixture in the middle of a prosciutto slice. Place a potato on top of the goat cheese. Wrap the prosciutto around the potato and secure with a toothpick. Repeat with the remaining ingredients. Serve. Disclosure: This post is sponsored by The Little Potato Company. All opinions are my own. I am a participant in the Amazon Services LLC Associates Program, an affiliate advertising program designed to provide a means for me to earn fees by linking to Amazon.com and affiliated sites.